Trivandrum, 23 November 2012: Poet Attoor Ravi Varma has been selected for the Ezhuthachan Puraskaram 2012, the highest literary prize instituted by the Government of Kerala. The award carries a cash prize of of Rs. 1.5 lakh, citation and a plaque. The committee comprising of Kerala Sahitya Akademi president Perumbadavam Sreedharan (chairman), D. Babu Paul, C.V. Balakrishnan, Akbar Kakkattil, and principal secretary Sajan Peter (member secretary) has chosen the poet for his outstanding contribution to Malayalam poetry. Poet Attoor Ravi Varma's major works incluude 'Attoor Ravi Varmayude Kavithakal', Kavitha, Chila Kurippukal, Nale Mattoru Naale Maathram, Bhakthikavyam etc. 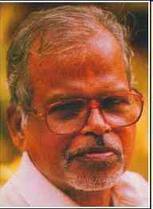 He has also won the Kendra Sahitya Akademi awards for poetry and translation and the Kerala Sahitya Akademi award.